Please see our “Booking & Reservations” page for Reservations. The Inn offers our guests tastefully furnished suites, each with a private bath, comfortable queen Sealy-Posturepedic Luxury-Plush bed sets which are made with crisp, quality bedding & linens. All rooms have been decorated and furnished with fine furniture & appointments. Every morning you’ll enjoy our house-made signature hot-entree breakfast. Three Oaks Inn, a historic private home of Three Oaks Village is an easy stroll to downtown Three Oaks attractions, galleries, shops, dining, winery/brewery, distillery and theaters. 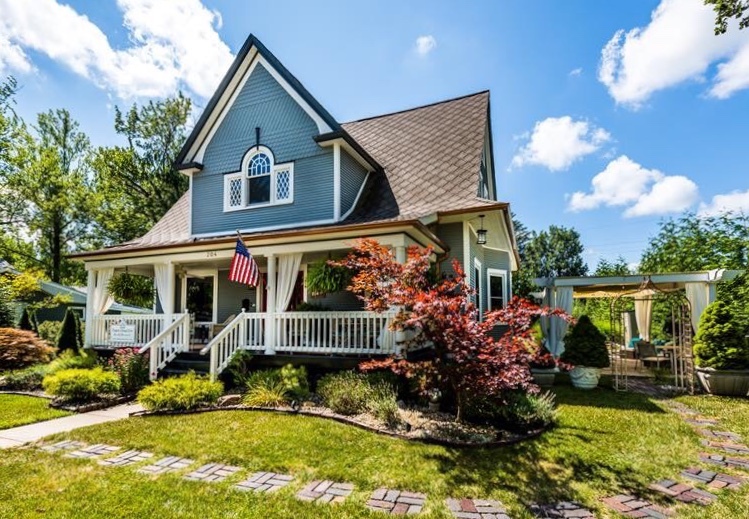 The Village of Three Oaks is just minutes from many area vineyards, beaches and everything HarborCountry & the surrounding Southwest Michigan area offers. There’s always something fun and interesting to enjoy year-round. We are a quick 30-minute drive to Notre Dame in South Bend, Indiana for our “Fighting Irish” fans. Children are welcome when the entire inn is reserved by a single party. Pets cannot be accommodated. Make sure you visit our “Links” page! Find Us On Yelp: Yelp!